Monday’s terrorist bombing in Boston has left me shaken. I have uttered words of disbelief and cried when I listened to the victims stories. My heart goes out to all of the victims and their families. Their senseless pain and suffering is beyond comprehension. Although I am far removed from this latest tragedy, I am still coping with the uncertainties of life. As I try to come to terms with this latest tragedy, I think back to the blog that I wrote just days after the February 2010 bombing in Pune. The blog was originally posted on my private travel blog. Today, I’m sharing it on this site. This blog was originally published on February 15, 2010 at sandystravel.wordpress.com. Is timing everything or are daily occurrences a matter of fate? What does a mere minute, a few hours, a few days, a month or two mean in the scheme of things? It is impossible to count the times when I wished that I had planned my day differently so that an unforeseen event would not have occurred. For example, a little more than five years ago, I set out on a bright sunny day to my student teaching job and ended up in a car accident on the Boulder/Denver turnpike. Immediately after the accident, I felt incredibly fortunate and grateful that I was in one piece and was alive. Within a matter of just a day, I began to feel the aftermath of the trauma of being hit at 50 mph to my body. Had I left earlier or later, is it possible that I might not have had to endure everything that was associated with the three surgeries that followed or was I destined to have a misfortune? On the other side of the coin are the times that I am intensely happy that something terrible has not occurred due to the fact that time was in my favor. In recent years, our son, Josh, has explored various parts of Asia. Just a few weeks before the tsunami hit, he had visited the famous beaches of Phuket, Thailand. His digital pictures illustrated a tropical paradise while the TV news reports showed a destroyed and devastated community. Frequent business trips and the desire to attend a Passover seder have repeatedly taken Josh to Mumbai. Last fall, we watched in horror as we saw the carnage and destruction after the terrorist attacks. Josh had been a guest at the Chabad House and had known the rabbi and his wife. He had also frequented the destroyed restaurant that was displayed vividly on the news reports that were constantly broadcasted on American TV. Despite these atrocities, Josh returned to Mumbai a week later on business and was not afraid to walk openly in the streets. 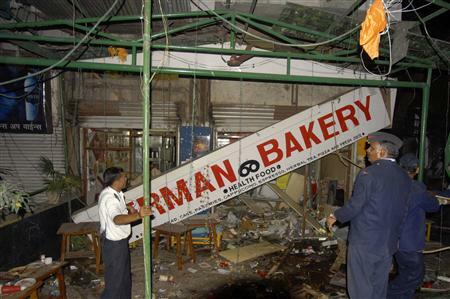 I cannot help but be somewhat shaken by the recent bombing at the German Bakery in Pune. Six days before this cowardly terrorist attack, Ira and I sat peacefully in this popular restaurant. We were surrounded by a diverse group of individuals who were there to enjoy good food and a friendly environment where strangers of all walks of life shared picnic style benches and tables. We were in this bustling restaurant for over an hour and then ended up waiting patiently on the busy street corner for our driver to return. Unlike other places we have visited, there was no security patrolling the outside of the restaurant’s makeshift structure. Would such a figurehead have been able to ward off individuals who were intent on random destruction? Probably not since the security measures taken outside restaurants and buildings are usually lax and are in sharp contrast to what you find in Israel. While confronting the events of last Saturday, I struggle with learning how to cope with the random uncertainties of life. Is there a spiritual quality of fate that ultimately controls what I am destined to experience or is my life’s journey dictated by both good and bad luck? What I do know is that I have the freedom to make my own choices. Attached to this concept of free will is the hope that whatever I do on a given day will have a positive outcome and that my Jewish belief system will ultimately give me the strength to deal effectively with any obstacle that I encounter. It is more than three years since I wrote the above post. Random acts of terror continue to occur. Innocent people suffer while evil and mentally ill people fulfill their irrational and destructive agendas. I continue to look for solace from multiple sources. A quote by R. I. Fitzhenry reminds me that uncertainty can lead to a positive outcome. Uncertainty and mystery are energies of life. Don’t let them scare you unduly, for they keep boredom at bay and spark creativity. As random acts of extreme violence become more commonplace, it is essential to harness the fears associated with uncertainty. Finding ways to contribute to the beauty of life and being grateful are two positive ways to counteract the fears that derive from moments of uncertainty. Redirecting negative energy to positive will make it easier to cope with the uncertainties of life.